Consult factory for availability of ERD Models. 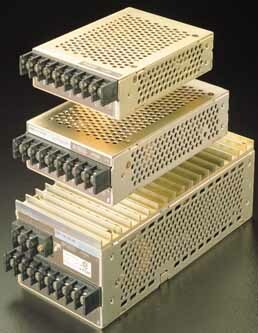 These are d-c to d-c converters operating at 300KHz. High frequency switching, plus extensive use of custom hybrid microcircuits with surface mount components, allows for small size (the ERD are only 3-3/4" high). The microcircuits afford high reliability by contributing to low parts count. The ERD are true transformer isolated power supplies whose output polarity is independent of the input. Available sizes: 30W, 60W, and 150W. Series ERD are DIN rail mountable.